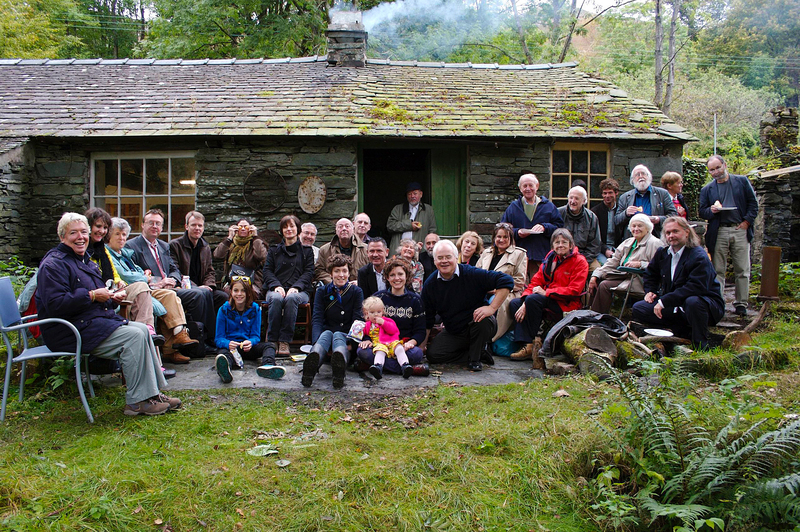 Littoral’s involvement with Kurt Schwitters and the Langdale Merz Barn began in 1998 and 1999, when we organised the ARTBARNS: AFTER KURT SCHWITTERS exhibition. 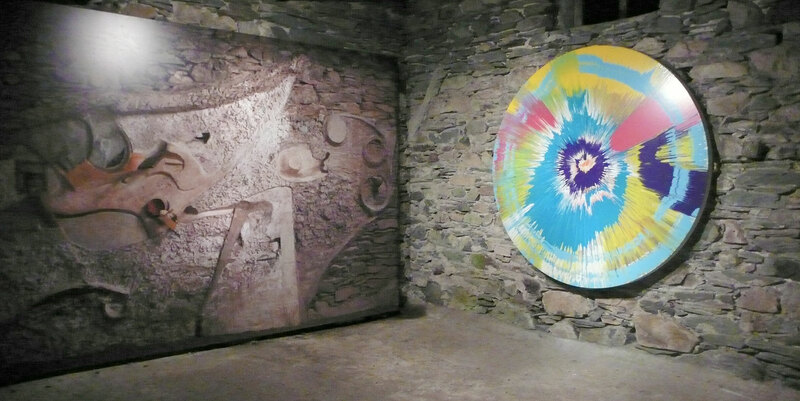 This ambitious project, which was supported by a grant from the Arts Lottery Fund, consisted of a programme of installations and exhibitions by national and international artists in disused farm barns in the Forest of Bowland, Lancashire, conceived as a response to the unfinished Merz Barn project by Kurt Schwitters in Cumbria in 1947. At this point Littoral was still operating under their old name, Projects Environment, and their aim was to encourage artists to turn their minds to environmental concerns. 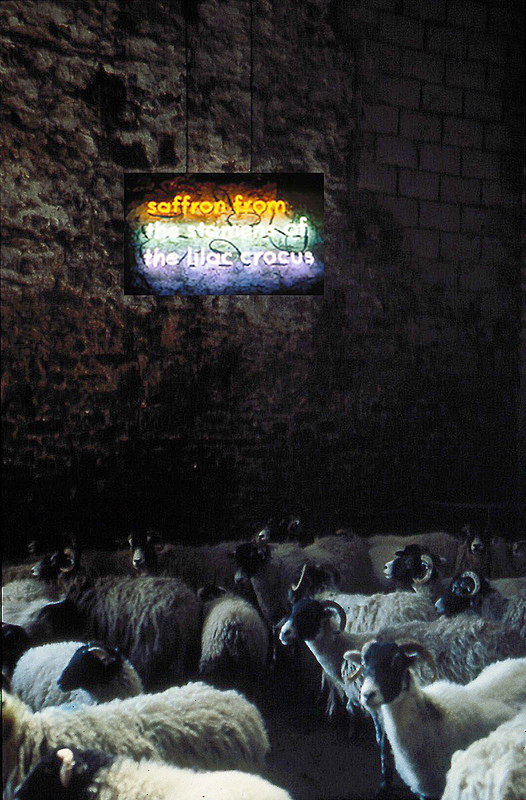 ThArtBarns programme was framed to provide contemporary artists with an opportunity to produce new work addressing aspects of the current crisis in British farming, concentrating on the sheep farms, and taking Kurt Schwitters’ Merz Barn project in Langdale as a point of departure. The traditional barns in Bowland, some of them very handsome buildings, are lying empty, too small for storage of modern agricultural machinery and no longer needed for storing hay. We saw them as the rural equivalent of the old warehouses that provided a niche for urban artists once no longer needed for their primary purpose. Toro’s barn was plastered with cow dung in the traditional Nigerian style, painted, and inset with cowrie shells. One of the stated aims of the project was to encourage farmers and their families to take an interest in contemporary art. We had, to be honest, nor been absolutely sure that this would happen, and were somewhat amazed when we discovered that the farmers were in fact travelling round inspecting the 16 exhibition locations. Bowland farmers in Masons House Farm barn. The tenant farmer, John Hartley (white shirt) has adopted a proprietorial air as he explains the project to his neighbours. The truth, as we later realised, was that our project had offered the shy and normally quite isolated farmers a brilliant opportunity to visit each others’ farms and find out exactly how things were going on with their neighbours. Poster for the first of Littoral’s Schwitters related conferences, Ambleside, September 17 to 19, 1999. At the 1999 Merz Conference: Littoral Patron Mary Burkitt with Klaus Stadtmüller of the Volkswagen Foundation. In the Merz Barn: attendees at the Schwitters conference visiting the Barn, 1999. This became the first of the annual autumn visits that eventually transformed into the ‘KS’ Autumn Schools. The Merzbarn Conference, which had been something of an afterthought, was extremely successful, attracting delegates from a large number of countries, and suddenly the Merz Barn project was born. A Kurt Schwitters in England working party was set up, with a founding meeting at the Courtauld Institute of Art in London on November 27th 1999 to discuss the outcomes of the conference, and the way forward. Littoral and the Kurt Schwitters in England working party, whose members included the art critic Jasia Reichardt, art historian Dr Sarah Wilson of the Courtauld Institute, Adrian Glew, Tate Archivist, artist John Baldwin, and Geoff Thomas, son of Schwitters’ English partner Edith Thomas (Wantee), continued to meet three or four times yearly for the next few years, and annual Open Days were held at the Merz Barn by kind permission of the owner, Bill Pierce. In July 2004 Littoral and the KSIE working group organised the Merz-Land conference at Tate Britain. John Elderfield, Senior Curator of Painting at the New York Museum of Modern Art (MoMA) was the keynote speaker, memorably describing Kurt Schwitters as ‘more important than Picasso’. A key event was the evening trip by party boat upriver to Barnes, where delegates visited the house next door to the one in which Schwitters had lived during his time in London. Ian Hunter and Marit Muenzberg raced on ahead on Marit’s motor cycle in time to hang poster effigies of Kurt and Wantee from Hammersmith Bridge to greet the party, on the spot where, as the anecdote has it, the two were once parted by an air-raid warning, each retreating to a different side of the river, not sure whether they would ever meet one another again. Marit Muenzberg and Ian Hunter sped on ahead of the party boat to Hammersmith Bridge to wave at the delegates as they chugged beneath. The owners of the house where Schwitters had stayed, unfortunately, were away, but their next door neighbours sportingly offered to let the party use their garden for an impromptu reception with the Deputy Mayor of Richmond, light refreshments, and a vigorous performance by the Ngati Ranana group of ex-pat Maoris. Geoff Thomas addressing conference attendees at the reception in Batnes. Rosanna Raymond, long-term Littoral Trustee, and members of Ngati Ranana after their dance performance. Laurie Fricker and the Deputy Mayor of Richmond discovering that they both hail from Barnstaple. Astrid Schmetterling in the background. On the trip back to the Embankment from Barnes the delegates staged an impromptu Merz Kabaret with readings of the Ursonate, performances of some of Schwitters’ poems, and a hilarious sketch featuring Marc Dachy, an umbrella, Laurie Fricker, and a good deal of barking. Boarding the party boat: performance artist Kevin O’Connor at the Merz Passport Control. Maori perforance artist Rosanna Raymond on the boat, performing in the MerzKabaret. Laurie Fricker and Marc Dachy performing a Dada encounter between a mad umbrella man and a manic dog. Veteran artist Gustav Metzger on the boat. In 2005 Bill Pierce, the owner of Cylinders, approached Littoral, offering to sell the charity the Cylinders estate with the Merz Barn for a reasonable price. At the time Littoral (then still known by its first name, Projects Environment), was engaged in a wide programme of social and environmental projects, and had never considered becoming owners of such an enterprise, but Cylinders had been suffering more and more from dereliction over the years, and it was obvious that someone had to step in and save it. We were tipped off that the Northern Rock Foundation might be prepared to offer financial help, and a single letter to them resulted, magically, in a grant of £150,000 to purchase the site. A ‘Save the Merz Barn’ fund-raising event was held, again at Tate Britain, in 2006. Introduced by artist Richard Hamilton, the purpose was to raise the match funding required by Northern Rock before they could release the purchase money. Happily this was more than achieved. National and international artists generously donated works for inclusion in a fund raising auction, and Arts Council England North West provided a capital grant of £150,000 for restoration of the Merz Barn site. The auction of the donated works eventually took place in May 2009 at the Royal College of Art, as part of the Merzdorf exhibition, although several of the more important works were later sold at Sotheby’s, including the large Spin Painting by Damien Hirst, ‘Beautiful Lying in the Grass Falling into the Sky Painting’. Damien kindly allowed us to exhibit this painting in the Merz Barn during April 2009 to allow local and regional people a chance to see it, and incidentally to advertise the Merz Barn project. We opened the site to the public for the first time, and the Armitt Library was good enough to lend us the painting by Schwitters of Harry Pierce (on loan to them by Bill Pierce) so we were able to mount a small accompanying exhibition. The Westmorland Gazette,encouraged by Mike Glover our wonderful P.R. guru, published a helpful article, and many interested and interesting people came. Damien Hirst’s Spin Painting arrives at Cylinders: outside the Shippon. It is not easy now to remember how much has been achieved since November 2006, when the sale of Cylinders finally went through. The place had been neglected ever since the death of old Harry Pierce in 1966: his gardens were overgrown with native trees, the buildings were full of the detritus of ages, and the Merz Barn itself was collapsing where the new beam inserted to take the weight of the roof over the picture window inserted in the replacement wall was rotting and sagging. Interior of the shippon in early 2007. Harry Pierce’s drawing office in 2006. Clearing and re-surfacing the access pathways, removing fallen tree trunks and dangerous trees, and clearing the site of rubble were the first tasks, but conservation of the Merz Barn itself was also a priority. Adam Lowe of Factum Arte, Madrid, examining the original Merz Barn wall in the Hatton Gallery, April 2007. The sale of Cylinders went through in November 2006. In April 2007 a team of experts led by Derek Pullen, the Tate Conservator, and Adam Lowe whose company, Factum Arte, was using new laser photography techniques to create astounding accurate replicas of artworks and installations, visited the Hatton Gallery in Newcastle and the Merz Barn on the same day, as part of a consultancy process funded by the ACE NW grant. In 2007, in spite of the primitive conditions, the first artist residencies took place, and the first KS summer and autumn projects, beginning with the KS07 Autumn School, which centred on Schwitters’ poetic legacy. The guest speaker was the Beat poet Jerome Rothenberg, whose work bears the unmistakeable influence of the Dada poets. In front of the Shippon: KS07 attendees.